Shortly after I was born my grandfather, Hans Balle, purchased a new 1960 Lincoln. My grandmother, who suffered motion sickness, loved the car because of the smooth ride. The car was often seen streaking into Chicago on business. When Hans decided to purchase a new car he had become so fond of his Lincoln that he did not trade it in. Instead he used it for pleasure; hauling his grandchildren, picnics, Sunday tours and the like. The car has special personal memories since, as a child I spent many miles in the cavernous back seat with my brother as my grandparents roamed the hills of Northern Illinois and Southern Wisconsin. Some times I would lie on the package shelf and stare up through the enormous rear window as we wound our way along the Rock River under a cool green canopy of trees. Sometimes we would venture into a secluded place to pick berries or stop for lunch. Many of us have fond memories involving a car, and often these memories are the main reason we choose to collect a particular model. My case is no exception, the fact that my Lincoln is the very same one that I grew up in adds to the charm of owning and maintaining the vehicle. I have cleaned the car up and had the exterior repainted (the original Deerfield Green of course)and since 1995, I have spent many week ends pulling out all the old trunk liner, repairing the weather seal around the trunk and doors and many other such jobs. I was very pleased with the cosmetic difference these minor changes made and commented to my wife that the old Lincoln looked pretty nice for an old antique. To which she reminded me that I was older than the antique. While I have no current plans to do a ground up restoration, I have tried to use the best available used, NOS parts or good reproductions when working on the car as to preserve its originality. With a long laundry list of "things to do" I now have hobby that should take me well into retirement! The 58 - 60 Lincoln are often referred to as the "Forgotten Lincolns" These Lincolns were are largest unit-body vehicle ever made. . Styled by John Najjar these gigantic, finned monsters were initially as popular as the Eiffel tower in Paris or the Picasso on Daley plaza. The cars have even been unkindly referred to as "slant eyed Japanese pagodas". Due to the controversial styling and relatively high price, sales of these cars were poor and only 24,820 were produced in 1960. Fewer than 1,400 of the two-door hard-tops were produced in 1960, making them rarer than the convertible. Just as the once scorned Eiffel Tower and Picasso now define their respective cites, these distinctive Lincolns have come to represent the era of the fins. As collectors have begun to rediscover this classic model, the appreciation of the 58 - 60 Lincolns have actually out paced the 61 - 67 era Lincolns. The engine is the good old 430 cid with 315 bhp at 4100 rpm and maximum torque of 465 at 2,200 rpm. The car weighs Weight 5000 pounds has a length of 227 inches and a wheel base of 131 inches. The car maneuvers easily despite its large size. Factory Price: $5,500. This Lincoln has clocked 95,000 miles and does show evidence of its years of dependable service, however, the car is in good condition with most all of the parts intact. As the car was often used for Sunday drives and picnics, a 50's era picnic case / table is stored in the trunk. 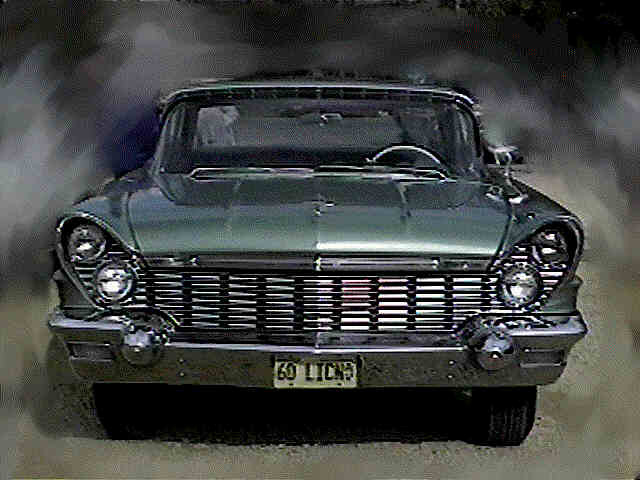 It is my plan to continue the picnic tradition with my 1960 Lincoln, wife and young sons.